Is it correct that the larger the ship, the more crowded the ship will be? Upon hearing that a given ship has a high gross tonnage, people often respond: “That's too big for me - - too many people.” But such statements are based upon the misconception that the larger the ship, the more passengers it will carry. A larger ship will not necessarily have more passengers than a smaller ship. To illustrate, Emerald Princess is 113,500 gross tons and can carry 3,070 passengers double occupancy. Celebrity Eclipse is nearly 10,000 gross tons larger but carries only 2,852 passengers. Queen Mary 2 is even larger at 151,000 gross tons but carries less passengers (2,618) than either Eclipse or Emerald Princess. The same lack of a direct correlation between size and passenger capacity can even exisit within the same cruise line. For example, Royal Caribbean's Majesty of the Seas (73,941 gross tons) has a passenger capacity of 2,350 double occupancy. Meanwhile, fleetmate Jewel of the Seas (90,090 gross tons) has a passenger capacity of 2,110. Thus, just because one ship is larger than another, it does not mean that she will be carrying more passengers. The reason why there is no absolute correlation between ship size and passenger capacity is that the cruise lines build ships to provide different types of experiences. Queen Mary 2 is designed to provide a sophisticated, elegant experience that requires more space per passenger. Freedom of the Seas, which is approximately the same size as QM2, is designed to provide a more family-style active adventure and so is built to accommodate many more passengers. To get an idea of how crowded a given ship will be, it is better to look at the passenger space ratio rather than the gross tonnage. The passenger space ratio is the gross tonnage divided by the passenger capacity. The higher the number, the more space per passenger. To illustrate, Queen Mary 2's is 57.6 (151,000/2,618). 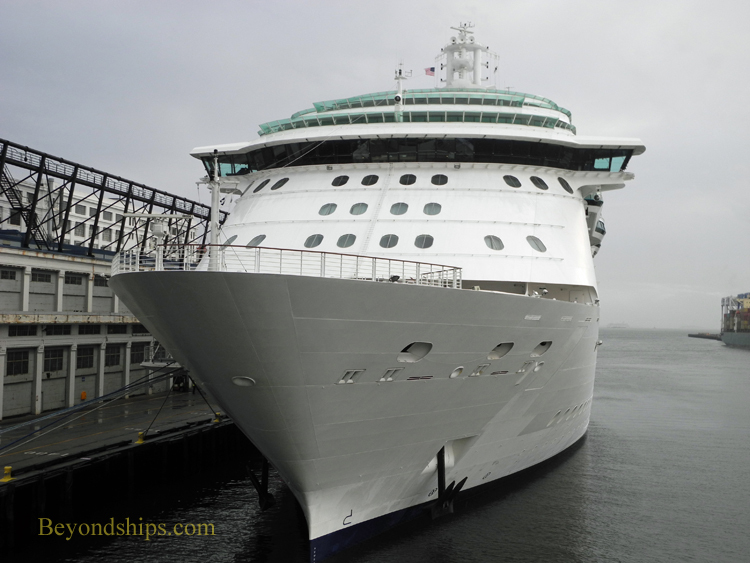 Freedom of the Seas' passenger space ratio is 42.4 (154,417/3,634). However, the amount of space per passenger is not the end of the story. How crowded you will feel also depends upon how well the cruise line has thought through the question of passenger flow - - the movement and distribution of the passengers throughout the ship. If all the passengers come to the same entertainment venue at the same time, the ship is going to feel very crowded. Conversely, if the passengers are distributed throughout the ship at a number of entertainment venues, the same ship is going to feel spacious. Consider the world's largest cruise ships - - Oasis of the Seas and her sister Allure of the Seas. Each ship can carry 5,400 passengers double occupancy. However, those expecting long lines and overcrowding are astonished to find that the lines are shorter and the ships' less crowded than on much smaller ships. The reason for this is that Royal Caribbean designed the ships to optimize passenger flow. For example, in the various ports of call, passengers returning to any ship have to pass through security before re-boarding. The usual practice is for the returning passengers to line up outside one or two shell doors (i.e. doors in the ship's hull) and go through one or two security machines located inside the ship. For Oasis and Allure, Royal has constructed huts on the piers to house a battery of security machines. After exiting the hut, passengers are able to go through any one of several shell doors. As a result, our experience has been that re-boarding these ships in the ports of call is quick and painless. Unfortunately, there is no single statistic that measure how well a cruise ship handles passenger flow. However, ships develop reputations over time as to whether they seem crowded. These surface in reviews and in passenger comments. Emerald Princess (above) is smaller than Queen Mary 2 (below) but carries more people. Allure of the Seas carries more passengers than any other cruise ship but has a reputation for feeling uncrowded. 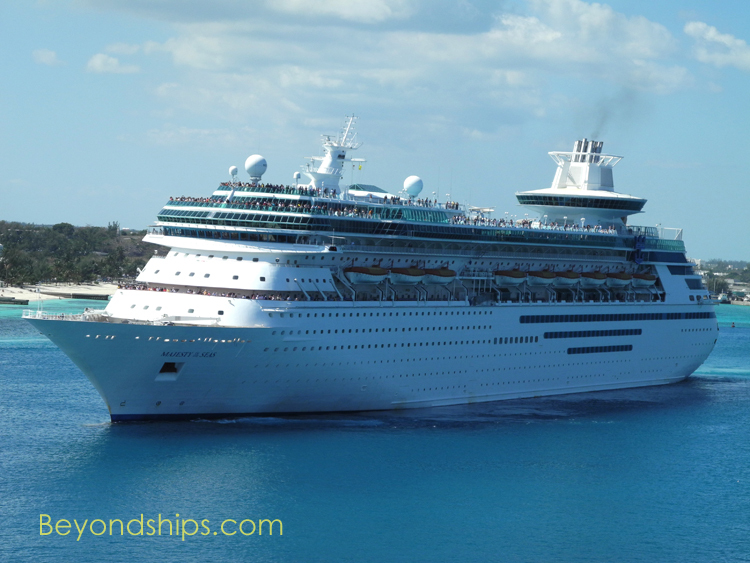 Cruise ship FAQs - - Is it true that the larger the ship, the more people will be aboard?